Boost production with the large capacity Ultravac 3000. 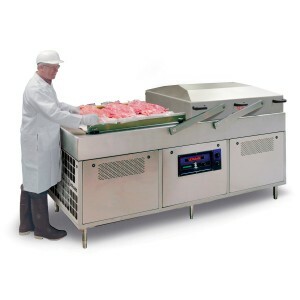 The jumbo chamber dimensions (39” L x 35” W x 12” D) of the Ultravac 3000 accommodate vacuum packaging of whole pork loins, whole beef primals, or even two 40 lb. cheese blocks at a time. Built tough in the USA and backed by a 2 year warranty, the Ultravac 3000 is an excellent machine! - Two 10 or 12-hp vacuum pumps standard!